men on fields in bright colors. ….we wish you a Happy Thanksgiving with our featured haiku poster from our 2012 Series: finely written by Sara Parrott and wonderfully illustrated by professional artist and instructor, Skip Frost. Community builds / bridges of thought between us / hope for the future. It’s Thanksgiving! An American celebration of thanks steeped in history and tradition. It’s “Over the river and through the woods” time! While some families are packing up the car to travel far and wide for the long weekend, others are preparing for the long-awaited arrival of loved ones. From our 2003 Series, this featured haiku poster nicely captures the spirit of arriving home with the hubbub of holiday activity downtown. The haiku was written by long-time contributor, Claire Bobrycki, and illustrated by former Syracuse University student, Sarah Mellgren. Long drive, weary eyes— / Cityscape lights the night sky / Syracuse, I’m home! It’s Turkey stuffing days! While plump turkeys are roasting and all manner of pies baking, there are those tracking tackles and downs, too. It’s still Autumn! Leaves have fallen, leaving trees mostly dark and bare. Night black fruit to pick. It’s late November! The weather is crisp and getting colder, while windy days are growing shorter and starry nights, longer. It’s the “Holidaze” season! Grocery stores are stuffed with shoppers while traffic delays are just beginning as Christmas Holiday sales lure folks to the mall. It’s time to sit in front of a cozy fire burning in the fireplace! From our 2014 Series, this featured haiku poster was beautifully created by former Syracuse University illustration student, Andrew Casadonte, (now a storyboard artist at DreamWorks TV Animation), using the fine phrasing of another of our long-time contributors, Paul Goat Allen. We hope we’ve made your Thanksgiving Holiday a bit richer with these wonderful poems gathered from our archives of contributed haiku! And, if you’re looking for a special Christmas gift for the poet or artist in your family, be sure to check out our Shop Page for some great ideas! Wishing you a cornucopia of good wishes for a healthy, happy and bounteous Thanksgiving Holiday Weekend with all the trimmings, warmth and comforts of the season. From our 2014 Syracuse Poster Project Series: created by poet: Vinh Dang and artist: Chad Wallace a professional illustrator who also writes and illustrates books for children. Oak leaves drift softly, Men on fields in bright colors. Tight spirals land hard. ….we wish you a Happy Thanksgiving! Scarecrows, Pumpkins and Mums, oh my! Have you noticed all the playful scarecrows and plump pumpkins on your drive into work these first few weeks of Autumn? They seem to be everywhere–decorating lamp posts and porch steps and cheering up many a cloudy morning. And don’t forget those towering sunflowers and short colorful mums wherever you look! Autumn is undoubtedly transforming the CNY landscape as we say goodbye to Summer. Shorter days, cooler nights have been the most noticeable, with treetops turning red and gold overnight. Elephant’s eye-high corn fields have been mostly cut or built into crazy mazes for Halloween fun, while local pumpkin patches are overflowing with vivid shades of orange. 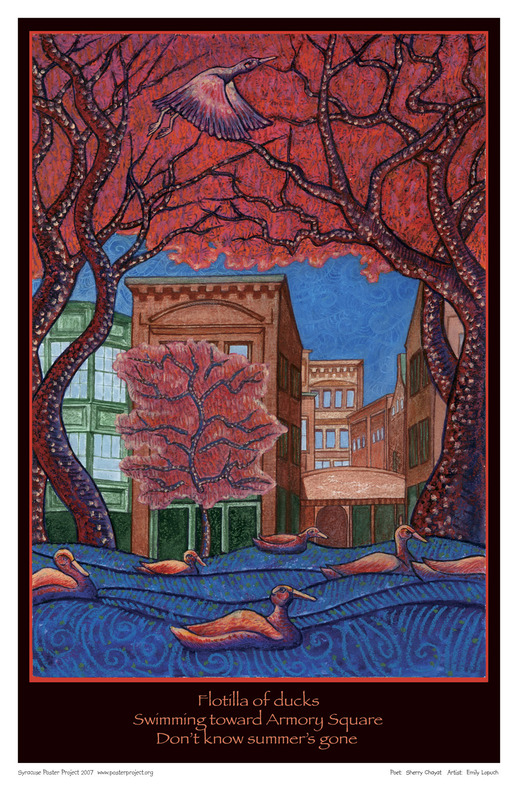 Our featured Syracuse Poster Project image this week beautifully illustrates autumn’s slow and colorful transformation of the Syracuse area. Created in 2007, the haiku was written by Syracuse, NY poet Sherry Chayat and illustrated by former Syracuse University Illustration student, Emily Lopuch, now an illustrator and aspiring writer living in Rhode Island. Syracuse Poster Project haiku contributor, Sheila Forsyth of Fayetteville, NY, wrote this touching farewell to Summer in 2011. How do you celebrate the arrival of Autumn? Can you sum it up in a Haiku? Send us your haiku in the comments and we’ll publish it here on the Poetry Blog next week! While the calendar says Autumn, it still feels like Summer in CNY. The sound of crickets has quieted at night and the kids are gone back to school. 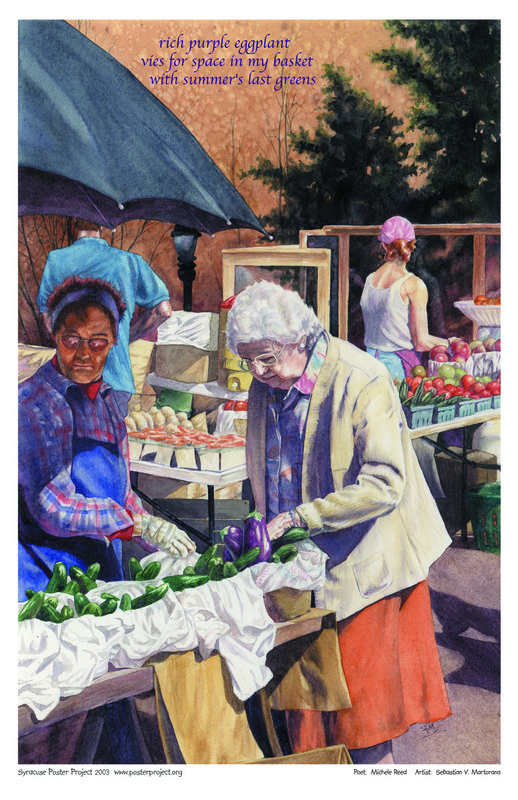 But the hustle and bustle at your local farmer’s market is still hopping! Last week, we wrote about celebrating the change of seasons with the bountiful harvests found nearly everywhere you turn here in CNY. In fact, you can still gather late summer fruits and vegetables from one of the many fruitful markets dotting Syracuse area communities. When we did not receive any new Harvest Haiku in response to our last post, we decided to dig a little deeper into our archives of un-illustrated haiku. We came across a few which splendidly reflect these end of September harvest days. This richly worded haiku was written in 2009 by frequent Syracuse Poster Project contributor, Sherry Chayat, from Syracuse, NY. Can you just picture this singular moment? Or this haiku? A picture postcard scene you might see on a drive down a country road in CNY! The poem was written in 2014 by Kathleen Pickard from Jordan, NY. 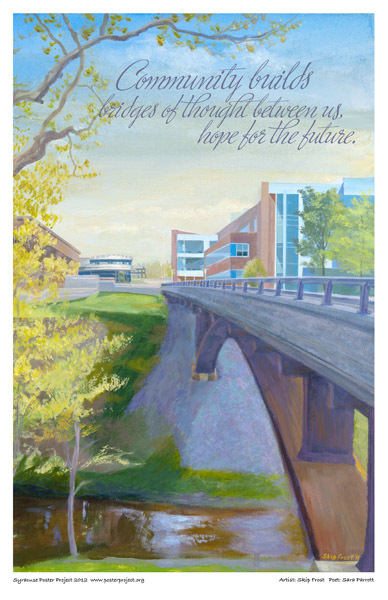 Another of our favorite haiku posters reflecting our bountiful CNY home was created in this beautiful Syracuse Poster Project illustration in 2003. The poet: Michele Reed. The former Syracuse University illustration student: Sebastian V. Martorana now an artist living and working in Baltimore, MD. What is your favorite September moment? Send us your haiku in the comments and we’ll publish it here on the Poetry Blog next week! One of our primary tenets here at the Syracuse Poster Project is to celebrate our hometown of Syracuse and its CNY neighbors with illustrated haiku. Oftentimes, a change of season in CNY is seen as a time of celebration and offers a wellspring of ideas for many of our haiku contributors. In fact, the time between late August and mid-September, when purple Asters and Queen Anne’s Lace still line country byways, is also the time we celebrate the region’s bountiful harvests and bid farewell to summer. Over the years, we’ve received wonderful haiku about this time of year. We recently dug into our treasure trove of un-illustrated poems and found several delightful haiku describing singular moments of this colorful season. 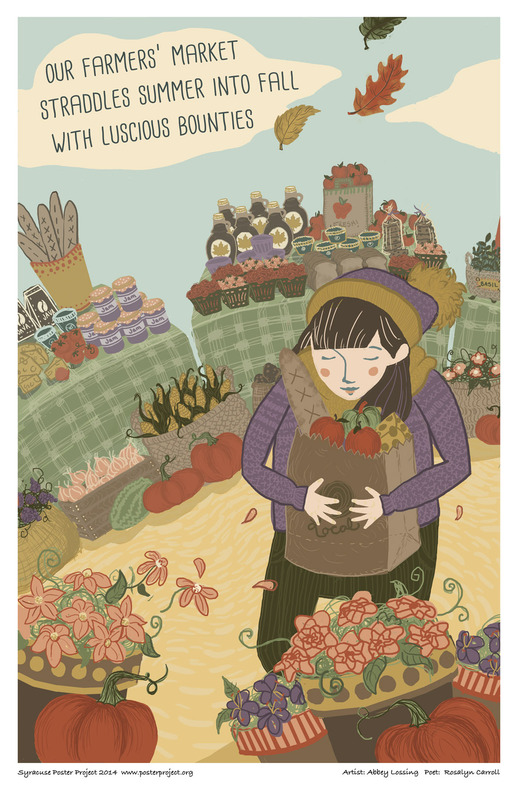 You may have seen some of our harvest themed haiku — beautifully interpreted by our Syracuse University illustration students — as posters in the many kiosks dotting Syracuse’s downtown. One of our favorite haiku posters of this bountiful CNY season was created in 2014. The haiku was written in 2010 by Manlius, NY poet, Rosalyn Carroll and illustrated by former SU Student, Abbey Lossing, now an art director at Buzzfeed. What do you like most about this time of year? Send us your Harvest Haiku in the comments and we will publish it here on our Poetry Blog.